Surf’s down and you’re wondering what to do? Grab a Carver skateboard! These are no ordinary skateboards. They were created in California by a bunch of passionate surfers who wanted to replicate the feeling of surfing the waves on the streets. A lot of thought has gone into making Carver skateboards, which are considered the next best thing when it comes to surfing. Many surfers use Carver skateboards as a replacement when the surf is not happening, but also to perfect their technique. Surf coaches recommend Carver skateboards over any other brand. Get a Carver skateboard today – you won’t believe the responsiveness of the board giving you the tight carves and pumping you’d normally get on your surf board. Pure fun! With Carver Skateboards, you have the option of the CX or C7 trucks as well as a variety of shapes and sizes. Come visit us at our shop and try one of the demos to see which truck you prefer. Or call us and one of our skilled staff will be more than happy to help you choose the perfect set-up. We offer free delivery throughout Australia, so place your order today. Carver Abec 7 Built-In Bearings are the ultimate bearing for speed, performance, and durability. Built with hardened Rockwell C-65 grade steel and precision grooved inner races, these bearings provide an ultra smooth ride with low rolling rolling resistance, less overall friction, and a longer bearing life. The built-in spacers and speed rings allow for an easy and hassle free installation creating a solid and perfectly centered set up. – Double Shielded for maximum protection from dirt and sand. – Oil Lubricated with a special synthetic lubricant for a faster spinning wheel. – Chrome steel ball bearings for maximum wear. – Deep-Groove polished race for faster roll and better side load rating. – Steel Cage will hold up longer to the heavy duty abuse of skateboarding. The Carver Bel Air 32.5″ Complete is based on the 1950’s era hot rod model. The wider 8 7/8″ template recalls the archetype of pool board mixed with a street board. For years we’ve been blending surf and skate, but as surfskate progresses and riders incorporate more traditional skateboard tricks into their style, we set out to design equipment that supports this progression. Lower, narrower trucks, new school double kick deck mould and smaller wheels all facilitate tricks while still supporting grippy, snappy carving. The Carver Bel Air 32.5″ Deck is based on the 1950’s era hot rod model. The wider 8 7/8″ template recalls the archetype of pool board mixed with a street board. This is the next generation of surfskate, blending tricks and flow into a complex, creative expression across the urban landscape. Carver has been blending surf and skate for years with their revolutionary skateboards. As surf skate’s have progressed and riders incorporate more traditional tricks into their style, Carver set out to design equipment that supports this progression. The Carver C5 Surf Street Silver Trucks have (C5 front, C4 rear – C5 System ), are shorter and narrower, lowering the centre of gravity and giving the tail more pop. The result is higher ollies and better control and the narrower hanger and deck keep it light and maneuverable. This is the next generation of surf skate, blending tricks and flow into a complex, creative expression across the urban landscape! The Carver C7 Riser Kit is made of soft rubber and inserted between the skateboard trucks and deck. This raises the height of the skateboard and decreases the chance of wheel bite. A real charger, Courtney Conlogue is known as the Sea Tiger for her fierce and competitive approach to surfing. Her newest model, the Carver Conlogue Sea Tiger 29.5” Complete, is short and wide, perfect for a snappy surf trainer. What’s the difference between the C7 and the CX? The C7 is Carver’s signature surfskate front truck. It has an incredible amount of pump and turning radius, with a spring loaded swing arm that allows the nose of the board to sway slightly from side to side, with slightly wider and more stable turns than a CX truck. Basically, it feels more like a twin fin to ride, but has an adjustable spring you can tension or loosen to vary your ride. The CX is Carver’s reverse-kingpin surfskate front truck. It has more pump and tighter turning than any other reverse kingpin truck on the market, but without any extra parts. It has a similar feel to the C7, allowing you to snap your turns from the tail and pump effortlessly for speed. It is more responsive than a C7 truck, with a lot more play in the tail, similar to a quad fin! Her newest model, the Carver Conlogue Sea Tiger 29.5” Complete, is short and wide, perfect for a snappy surf trainer.. The Carver CX Riser Kit is made of soft rubber and inserted between the skateboard trucks and deck. This raises the height of the skateboard and decreases the chance of wheel bite. With the 30.25” Firefly we’ve shaved ¾” off our popular 31 Resin to make this board even snappier while still retaining the same progressive shape of an archetypal square. Sometimes you want to dial in your wheelbase just so, and full-inch sizes are not specific enough. The narrower nose keeps the front of the board light and nimble, while the proper kick tail is a wedged deckpad that locks in your back foot where it counts, giving you leverage into any tail-driven trick. From boneless air grabs and ollies to bank and ditch surfing, this little board is a true surfskate. Practice the same tricks you want to perfect in the water, plus work on flow, trim and power carves. With a 16 ½” wheelbase you get a little more stability than other shorties, but not so much that you lose the super easy pump and the driveway-tight carving. Sometimes you want to dial in your wheelbase just so, and full-inch sizes are not specific enough. The narrower nose keeps the front of the board light and nimble, while the proper kick tail is a wedged deckpad that locks in your back foot where it counts, giving you leverage into any tail-driven trick. From boneless air grabs and ollies to bank and ditch surfing, this little board is a true surfskate. Practice the same tricks you want to perfect in the water, plus work on flow, trim and power carves. With a 16 ½” wheelbase you get a little more stability than other shorties, but not so much that you lose the super easy pump and the driveway-tight carving. Recommended with the CX truck set for a more progressive skate performance. The extended wheelbase on the Carver Greenroom 33.75″ Complete gives this board a very versatile blend of speed control and nimble handling. The C7 is Carver’s signature surfskate front truck. It has an incredible amount of pump and turning radius; with a spring loaded swing arm that allows the nose of the board to sway slightly from side to side. With slightly wider and more stable turns than a CX truck it is comparable to a twin fin to ride. However it has an adjustable spring you can tension or loosen to vary your ride. The CX is Carver’s reverse-kingpin surfskate front truck. It has more pump and tighter turning than any other reverse kingpin truck on the market, but without any extra parts. Although it’s similar feel to the C7, allowing you to snap your turns from the tail and pump effortlessly for speed. It is more responsive than a C7 truck, with a lot more play in the tail, similar to a quad fin! The extended wheelbase on the Carver Greenroom 33.75″ Deck gives this board a very versatile blend of speed control and nimble handling. Be environmentally friendly with the Carver Haedron No.3! While we all want that “magic” board that is beautiful and performs, we also want to preserve our diverse forests with a responsible use of premium materials. Carver has sourced a manufactured exotic veneer series that provides a look at the most rare and exotic woods made from sustainably grown and harvested trees which have been reformed into the grain patterns of endangered woods we’d never want to cut down. And because we recognise that one size does not fit all, we made a trio of lengths that gives you a complete quiver that covers short, mid and long wheelbases. Be environmentally friendly with the Carver Haedron No.6! Be environmentally friendly with the Carver Haedron No.9! Everybody wants the ‘magic’ board that is beautiful and performs. We also want to preserve our diverse forests with a responsible use of premium materials. Carver has sourced a manufactured exotic veneer series. They provide a look of the most rare and exotic woods made from sustainably grown and harvested trees which have been reformed into the grain patterns of endangered woods we’d never want to cut down. The Carver Impala 32″ Complete is inspired by the classic 1970’s lowrider favorite. The thinner 8 1/2″ template keeps it light, with a bit more room at the nose for wide stance carving. For years Carver have been blending surf and skate, but as surfskates progress and riders incorporate more traditional skateboard tricks into their style, the need to set out and design equipment supporting this progression has increased. Lower, narrower trucks, new school double kick deck mould and smaller wheels all facilitate tricks while still supporting grippy, snappy carving. Skateboarders have invented many great tricks since the early days, and a truly modern surfskate needs to incorporate this history of progression. The C5 System (C5 front, C4 rear) is shorter and narrower, lowering the centre of gravity and giving the tail more pop. You get higher ollies and better control and the narrower hanger and deck keep it light and manoeuvrable. The Carver Impala 32″ Deck is inspired by the classic 1970’s lowrider favorite. The thinner 8 1/2″ template keeps it light, with a bit more room at the nose for wide stance carving. The Carver Mini Simmons 27.5″ Complete was inspired by Bob Simmons, the father of the modern shortboard. This ‘little big board’ is short and wide for super tight turning and easy pumping, all with a bigger board feel! The CX is Carver’s reverse-kingpin surfskate front truck. It has more pump and tighter turning than any other reverse kingpin truck on the market, but without any extra parts. Has a similar feel to the C7, allowing you to snap your turns from the tail and pump effortlessly for speed. It is more responsive than a C7 truck, with a lot more play in the tail, similar to a quad fin! The Carver Mini Simmons 27.5″ Deck was inspired by Bob Simmons, the father of the modern shortboard. This ‘little big board’ is short and wide, providing super tight turning and easy pumping, all with a bigger board feel. The Carver Oracle 31″ Complete is designed for any rider with a smaller and nimble shape and style. It’s wide where it counts and pulled in where it can, to give a balance of manoeuvrability on the flats and speed on the hills! The Carver Oracle 31″ Deck is designed for any rider with a smaller and nimble shape and style. It’s wide where it counts and pulled in where it can, to give a balance of manoeuvrability on the flats and speed on the hills! 21 Years tells it all. Featuring the new “Hyperspoon” mold with a deeper front foot pocket, the Origin is smooth and flowy with confident rail to rail responsiveness. Carver started with the sea, and with the joy of sliding on the face of a wave. But we are also surrounded by an abundance of municipally made inclined surfaces, our ‘waves by proxy’, so we slide across all this cement on watery bearings, capturing a similar kind of potential energy. Surfing inspired Carver’s innovative skateboard trucks, and now 21 years later we celebrate the true origin of our stoke; the wave and the process of its creation. The graphic tells the story of the origin of waves, from the sun and winds to the moon and tides. Like our own history, we began as a small ripple, building into a groundswell over time. We chronicle this history in the new documentary ’21 Years of Stoke’, showing the beginnings of Carver and this nascent surfskate renaissance. In those early days we rode everything on one board, long enough to handle a hill with skill, short enough to have fun pumping a driveway bank. Wide and short with a stretched-out wheelbase, this proportion always worked well, so we made this commemorative 21 year board just that. We made the quintessential surfskate shape by literally combining contours of a surfboard nose with a skateboard tail, both from a metaphoric and functional standpoint. Introducing the new Hyperspoon mold, our most advanced surfskate mold yet, this new mold features a deeper spooned nose and a more progressive skate tail. It’s a more extreme version of our classic Spoon mold, continuing to push surfskate performance forward. The CX is Carver’s reverse-kingpin surfskate front truck. The CX trucks have more pump and a tighter turning radius than any other reverse kingpin truck on the market, but without any extra parts. It has a similar feel to the C7, allowing you to snap your turns from the tail and pump effortlessly for speed. It is more responsive than a C7 truck, with a lot more play in the tail, similar to a quad fin! The Carver Proteus 30″ Complete is designed to match the new Proteus surfboard, sharing the same template & performance characteristics, resulting in a seamless transition from land to sea. The Proteus has a boxy template, giving your front foot more support and allowing for a wider stance on a shorter board. The clipped nose reduces swing weight when snapping a turn. The concave spoon nose hugs your foot and increases leverage, while the proper tail kick gives you the pop you need for ollies, pivots and bone-lesses. The Proteus comes with the new Roundhouse Concave wheels. They are designed to increase grip over standard wheel designs. The arched surface flexes to hug the road, allowing you to lean into turns like never before. The Proteus skateboard features a boxy template, giving your front foot more support and allowing for a wider stance on a shorter board, while the clipped nose reduces swing weight when snapping a turn. The concave spoon nose hugs your foot and increases leverage, while the proper tail kick gives you the pop you need for ollies, pivots and bonelesses. The Proteus comes with the new Roundhouse Concaves, which are designed to increase grip over standard wheel designs. The arched surface flexes to hug the road, allowing you to lean into turns like never before, and come the closest to the kind of hold you get from a surfboard rail buried in the face of a wave. CX truck set is recommended to give a snappy thruster/quad performance. Made in the USA from custom mixed urethane specifically formulated for Carver’s new Roundhouse brand. Comes in Black 58mm x 90a wheels. Our trucks are all about carving, and wheel traction is key, so we’ve designed a wheel that is all about grip and speed. The Mag is a delicate balance of a square-edged lip to maximize grip and a harder centre profIle for speed. The key is in the shape of the lip; thin at the edge but quickly getting thicker, with a hollow relief near the core. What this does is create a spring-loaded, rebounding lip, so each time you pump for speed the wheel pumps back. Because the contact patch is nice and wide you can really dig into your rail and these wheels stick. 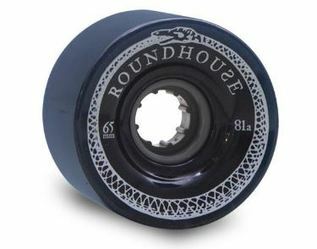 Made in the USA from custom mixed urethane specifically formulated for Carver’s new Roundhouse brand. Roundhouse Concave Wheels give you extra projection out of your turns so you can complete maneuvers you’d otherwise slide out on. These wheels have consistent roll speed and are the grippiest wheels you’ll ever ride! Carver trucks are all about carving, and wheel traction is key, so they’ve designed a wheel that is all about grip and speed! The Mag is a delicate balance of a square-edged lip to maximize grip and a harder centre profile for speed. The key is in the shape of the lip; thin at the edge but quickly getting thicker, with a hollow relief near the core. What this does is create a spring-loaded, rebounding lip, so each time you pump for speed the wheel pumps back. And because the contact patch is nice and wide you can really dig into your rail and these wheels stick. Made in the USA from custom mixed urethane specifically formulated for Carver’s new Roundhouse brand. This universal pocket shop measures in at under 2½” in length, so it’s easy to bring along on a session for on-the-fly adjusting. Made of tool grade stainless steel, it won’t rust, break or wear out, guaranteed. The Allen key snaps on with a powerful neodymium magnet. While this board might be short, it comes up wide. A mini made for the full sized rider, this lil’ snapper is packing both width and wheelbase, making this the ideal trunk board for your paddle out warm-up. The CX is Carver’s reverse-kingpin surfskate front truck. More pump and tighter turning than any other reverse kingpin truck on the market, but without any extra parts. It has a similar feel to the C7, allowing you to snap your turns from the tail and pump effortlessly for speed. It is more responsive than a C7 truck, with a lot more play in the tail, similar to a quad fin! The Carver Swallow 29″ Complete has been one of our favourite boards for years and a staple in the Carver quiver. This little board handles like it’s namesake, fast and loose. The combination of short and wide is magic, because the shorter wheelbase makes pumping this board on the flats just effortless, but the extra width and concave makes it a comfortable cruiser, too. The kick tail completes the versatility, giving you some needed pop for kick turns and crack-in-the-road hopping, explaining why it’s been one of the longest running designs in the Carver line. Carver updated the graphic with one of surf-artist Ryan Kleiner’s hand painted waves, evoking exactly the feeling of looking through the eye of the tube. This board will work equally well with either the C7 or CX truck sets; the C7 truck will give the board a more flowing performance with a great range of adjustability, while the CX trucks will give the board a more snappy performance with a lighter frame. The 29” Swallow has been one of our favourite boards for years and a staple in the Carver quiver. This little board handles like it’s namesake, fast and loose. Carver updated the graphic with one of surf-artist Ryan Kleiner’s hand painted waves, evoking exactly the feeling of looking through the eye of the tube. This board will work equally well with either the C7 or CX truck sets; the C7 set will give the board a more flowing performance with a great range of adjustability, the CX trucks will give the board a more snappy performance with a lighter frame. As thin as air, the Argon is the smallest board in the line, proportioned to give the lightest rider the full surfskate experience. With softer bushings and the lower C5 truck set, its responsive and easy to carve. Triton is born of the sea, but rides atop the land. It carves with the same power, speed and flow of the fabled finned watercraft that inspired it. Everything about it is pure surf, from the directional templates and iconic graphics to the quick turning geometry and easy rail-to-rail pump. Triton’s high performance comes from it’s precision-pivot Carver trucks, fast and grippy Roundhouse wheels and 7 ply hard rock maple Triton deck, each the result of over 20 years of surfskate innovation and experience. Made for the world market, it comes with the commitment to good design and durability that makes Triton the true surfskate of the people so wherever you are, you can MAKE WAVES. The Carver Triton Black Star 30.5″ Complete has a wider spooned nose and fuller kick tail. This model is ideal for banks and skateparks and for those looking for that classic old-school feel. Triton’s high performance comes from it’s precision-pivot Carver CX trucks, fast and grippy Roundhouse wheels, and a rock hard 7 ply maple constructed Triton deck! The Carver Triton Blue Horizon 31″ Complete is a similar shape to the Carver Resin. It’s plenty wide and just the right length so you can snap and pump with ease, and drop in to any hill with confidence. The Carver Triton Green Glass 32.5″ Complete is born of the sea, but rides atop the land. It carves with the same power, speed and flow of the fabled finned watercraft that inspired it. Everything about it is pure surf, from the directional templates and iconic graphics to the quick turning geometry and easy rail-to-rail pump. A minnow-sized fish, the Hydron features Carver’s softer bushings and lower trucks on a grom sized deck for the full surf and skate experience at any age. A step up in size, the Nitron is small enough for kids, big enough for adults. Featuring the taller CX truck set, this little board can lean deep and carve hard. The Carver Triton Red Diamond 29″ Complete is born from the sea! This 29″ board is on the smaller side for easy stashing and throwing around. It’s perfect for a little driveway snapper that’s sized for riders who want a board that’s super easy to pump. Triton’s high performance comes from it’s precision-pivot Carver CX trucks, fast and grippy Roundhouse wheels, and a rock hard 7 ply maple constructed Triton deck! Our little big board, The Xenon is a real performer for all ages. With a longer wheelbase and taller trucks on a slim deck, it can be the one board quiver that everyone can have fun on. The latest model in the Carver signature series now comes in Graphite! Years of riding and research has been put into this Patented surfing machine. The extra lateral movement of this front truck loosens up the nose of the board for unprecedented snap. Now it effortlessly drives you forward with every pump. The smooth arm rotation rides on a 1 5/8″ precision thrust bearing set and the heavy-duty internal spring. It has a wide range of tension adjustment so you can thoroughly customise the feel of your ride. The wider 6.5″ hangar is designed to suit bigger, longer boards. This model feels slightly looser rail-to-rail when compared to our narrower 5.0″ model. The Carver C7 6.5″ Trucks are the latest model in the Carver signature series. Years of riding and research have been put into this Patented surfing machine. The extra lateral movement of this front truck loosens up the nose of the board for unprecedented snap. Effortlessly driving you forward with every pump. The smooth arm rotation rides on a 1 5/8″ precision thrust bearing set and the heavy-duty internal spring has a wide range of tension adjustment so you can thoroughly customise the feel of your ride. The wider 6.5″ hangar is well suited to bigger, longer boards. Also it feels slightly looser rail-to-rail than our narrower 5.0″ model. Carver upgraded their Link so it’s made from Grade 8 steel with extra side ribs at the 90 degree bend for extra strength, and they’ve added a C-clip to the Spring Bolt so that if it ever loosens up it will never fall out. It’s easy to install, just pull the clip off the groove, assemble the C7 as you normally would (see Carver C7 Tech Specs for detailed instructions) and then snap the C-clip on. The Carver Trucks – C7 Replacement Hanger is very easy to install! This custom Carver C7 Spring is made out of Rocket Wire, the best aerospace material available for ultimate durability. The surface has undergone a polishing process to remove minute cracks that can grow over time and contribute to spring failure. The spring is then lightly oiled to prevent surface rust and Carver recommends using a liberal amount of Marine Grease or high quality bicycle bearing grease, for quiet and long-lasting action. 1.25″ long x 5/8″ OD. Carver C7 Thrust Bearing Set: Like your wheel bearings, water, sand and heavy use can rust and/or wear out your bearings. These heavy-duty Washers are much more durable than the standard thickness Washers, but in order to fit them into the C7 we had to make more room on the Arm Bearing Plate for them. So if you have a pre-2009 C7 and you need to replace your Thrust Bearings for any reason, whether because you have a cracked Washer or a rusty or worn out Thrust Bearing Set, this Kit will provide you with all the parts you need to rebuild your C7 with the latest improvements, including our newest Link, made with Grade 8 steel with extra side ribs at the bend for extra strength. 1- One C7 Arm with Kingpin, Bronze Bearing and Pivot Cup already pressed in. On the one hand it’s a lightweight standard RKP (Reverse King Pin) hanger and base, on the other it has a patented geometry that squeezes every bit of turn and pump from the system. This means that you can pump this truck like a C7, but it lands airs and rides fakie with more stability as well. This opens up aerial maneuvers, and keys in with the latest progression of airs in surfIng. The truck set comes as a matched set with our C2 6.5″ standard truck for optimal performance and includes 3 Front 3 Rear Carver gasket riser pads. This is Carver’s hybrid surf and skate truck! On the one hand it’s a lightweight standard RKP (Reverse King Pin) hanger and base. On the other it has a patented geometry that squeezes every bit of turn and pump from the system. This means that you can pump this truck like a C7, but it lands airs and rides fakie with more stability as well. This opens up aerial maneuvers, and keys in with the latest progression of airs in surfIng. The truck set comes as a matched set with our C2 6.5″ standard truck for optimal performance and includes 3 Front 3 Rear Carver gasket riser pads and hardware. The CX is Carver’s reverse-kingpin surfskate front truck and it has more pump and tighter turning than any other reverse kingpin truck on the market, but without any extra parts. It has a similar feel to the C7, allowing you to snap your turns from the tail and pump effortlessly for speed. The CX is more responsive than a C7 truck, with a lot more play in the tail, similar to a quad fin! The CX Mini is Carver’s surfskate truck for mini cruisers. Being narrow and low, it works perfectly on small decks under 27” long and under 7 ¾” wide. It’s a lightweight RKP (Reverse King Pin) hanger and base is designed with our patented geometry. It is set up with with the C2 narrow SKP (Standard Kin Pin) truck. Giving the rider every bit of turn and pump from the system. Since it’s meant for such a small deck the CX Mini geometry is a little tighter than it’s larger cousin, the CX 6.5″. This means that you can pump this truck like a surfboard. But it still has a bit more stability to handle the super short wheelbase of a mini. The Truck Set comes as a matched set with our C2 5.0″ standard truck and includes 2 Front 2 Rear Carver gasket riser pads plus mounting hardware. The C7 is Carver’s signature surfskate front truck. It has an incredible amount of pump paired with a crazy tight turning radius. This is thanks to a spring loaded swing arm that allows the nose of the board to sway slightly from side to side. With slightly wider and more stable turns than a CX truck. Basically, it feels more like a twin fin to ride. However you can still customise it with a tighten of a spring. Carver have you sorted with a brand new CX Standard Bushing Set to replace everything! Carver’s commitment to surfskate began with surfing, so it’s natural we’d partner with shapers who’s vision overlapped with ours. Tyler Hatzikian’s focus on functional tradition dovetailed into our passion for modern surfskate perfectly. We’re stoked to introduce the new Carver Tyler Riddler 35.5″ Complete. At 35.5″ it’s just long enough for a small cross step, while the longer wheelbase pumps faster. The mid-sized deck is also short enough to keep the responsive turning characteristics of the Riddler. A great transitional size that will help longboarders practice cutbacks and strengthen maneuvers on the wave, it features a single concave down the length and a proper kick tail for pivot turns and acid drops. Because that’s what Tyler’s Retro-Modern style is all about: integrating innovative performance with classic longboard flow and style! And as part of the collaboration, Tyler has produced a custom Carver Riddler surfboard. A truly unique take on the evolution of the traditional noserider, the Riddler combines tight, effortless turning with a highly developed noseriding ability. The winged outline and down-rail combined with the blunt-nose design translate directly to enhanced responsiveness from both tail and tip. A classic Tyler Advanced-Traditional design. The Carver Tyler Riddler 35.5″ Deck is mid-sized, but is long enough to move around on while still keeping the responsive turning characteristics of the Riddler. A great transitional size that will help longboarders practice cutbacks and strengthen maneouvers on the wave, it features a single concave down the length and a proper kick tail for pivot turns, acid drops and anything else you can think of popping. The C7 truck set is recommended to achieve a flowing single fin performance. This board is for the Grommies out there who want a really progressive Surf Skate! Carver is a proud sponsor of the USA Surf Team, the hottest group of grom’s to ever snap a turn. During a recent training session in Huntington Beach we met up with the team, many of whom already ride Carver, to test new demo’s and get feedback on board design. You’d think a group of 16 surfers would all have different opinions when it came to designing their favourite board, but we were surprised to hear many of the same ideas from the whole team, so we sharpened our pencil and took some notes. They all liked the performance of a 30” board with a 16” wheelbase, but wanted a little more nose kick to really lock the front foot in place for more progressive riding, like blow tails, 180 reverses and big boneless airs. The team now uses this board in training sessions to work on flow, power, stamina and style, and we have already witnessed the boost this has given the team. These kids are the future of surfing, and this board is the future of surfskate. Recommended with the CX truck set for most progressive surfskating. Designed for the taller riders on the USA Surf Team, this big boy thruster holds a fast line with its longer wheelbase, providing a wider stance and more stability. Unlike any other plastic skateboard, The Ahi is wider and has concave providing true performance and the feeling of being locked-in when riding. Built for a lifetime of riding, the durable and rigid deck maintains stability and stiffness in all riding conditions. By coupling our patented surfskate technology with Bureo’s philanthropic sustainable manufacturing process, this little ripper will not only improve your surfing but also empower you to help save the ocean that we depend on and love so much. This board comes with a fish scale grip pattern with custom grip tape, a unique fisheye locking hole, stainless steel hardware and Carver’s Roundhouse Mag 65MM x 81A wheels. Wheel colour may vary. The Ahi’ is made from recycled fishing nets. Based on a best-selling Carver template, this model features a double kick and nose flip design, with a fully functional tail kick. The very definition of Speed, Power, and Flow, this classic board brings back the drive and control of historic power surfing, with a slightly longer wheelbase and narrower pintail template for drawn out lines. We made a surf/skate pairing around Al Merrick’s iconic Channel Islands Flyer, with its wider tail bump for increased back foot leverage, while preserving an overall thinner and snappier template. Developed with Channel Islands around their classic Pod Mod, this groveler shortboard is meant to be ridden wider and shorter for progressive everyday performance. This Carver Skateboards collaboration surf/skate model with Channel Islands, the Pod Mod, is meant to be ridden wider and shorter! Carver Skateboards went with these characteristics and kept it on the shorter side, while giving it a bit fuller template for increased control rail-to-rail. Carver Skateboards are continuing their development of surf/skate pairings with the iconic Channel Pod Mod, designed by Al Merrick. You know a nickname will stick once your friends start laughing – and Yago’s is the Skinny Goat. Because Yago was already riding Carver he knew what he wanted; a 17” wheelbase to match his surf stance and a double-kick deck for progressive surf training and skatepark surfing. With art by his longtime surfboard painter Alan Fendrich on an eco-certified fumed Oak veneer, this board is as beautiful as it is functional. Comes with Roundhouse Concave wheels for maximum grip so you can really lean into your turns. Because Yago was already riding Carver he knew what he wanted; a 17” wheelbase to match his surf stance and a double-kick deck for progressive surf training and skatepark surfing. And with art by his longtime surfboard painter Alan Fendrich on an eco-certified fumed Oak veneer, this board is as beautiful as it is functional. Comes with Roundhouse Concave wheels for maximum grip so you can really lean into your turns. For Yago’s new model, we kept the same wide stance and double kick that made this model so progressive, but we shortened and widened the template to reduce the size. The Loaded Poke x Carver 34″ Complete is an amazing looking set-up and rides like a dream! After being inspired by this awesome pumping/carving Loaded deck and loving the feel of the Carver Trucks, we started experimenting about 5 years ago and came up with this unique carver! The Lost x Carver Beanbag 28″ Complete, is an extreme ‘small board’ concept. This super-wide, super-short ‘double-ender’ is meant to maximize the surface area for your feet, improving rail control on what would otherwise be a very small mini. …Lost Surfskates is Carver’s newest collaboration with …Lost Surfboards and Matt ‘Mayhem’ Biolos. One of the most cutting edge board designers in surfing today, Mayhem’s brash exploration of progressive surfboard design is the inspiration driving the brand, and his go-for-it style is reflected in the bold look of this this new collection. The Lost x Carver Beanbag 28″ Deck, is an extreme ‘small board’ concept. This super-wide, super-short ‘double-ender’ is meant to maximize the surface area for your feet, improving rail control on what would otherwise be a very small mini. We’re not symmetrical, so why should our boards be? The Maysym is the answer to that simple question. With different outlines on each side, the Maysym surfskate performs for both stances. 21 Years tells it all. Featuring the new ‘Hyperspoon’ mould with a deeper front foot pocket, the Origin is smooth and flowy with confident rail to rail responsiveness. Short ’n wide, for a quick pumping ride and plenty of glide. Designed for no toe drag, barefoot beer runs and grocery store rounds. Turn sharp and look sharp, while slashing sidewalks or pumping parks. ….Walk the Plank! Scare away the helpless hordes while shredding side walks on this swallow tailed, double winged weapon. Featuring radical ResinWorks art, by The Son Of Cobra, the Psycho Killer is a real street slayer. The RNF Retro is the latest iteration of Mayhem’s most classic model. Featuring a distinctive ‘double side cut’ outline, classic tint and custom logo, it’s like a vintage hot rod souped up with a modern motor. The best of both worlds, and now you can have your cool and rip it, too. The V3 Rocket is the triple-winged stepchild of the classic Mayhem Rocket, and is one of the recent surfing world’s more innovative and imitated designs. Wings are strategically placed to provide positive rear foot traction, while chasing pigeons off the promenade. After customising numerous Powell Peralta boards with Carver C7 and CX 6.5″ trucks, we thought it was time to offer this online! This set-up comes with the Powell Bones Brigade 7th Series Mike McGill Jet Fighter 10.28″ Deck and RAD 72mm wheels for extra performance! There are definitely not many of these custom Carver completes floating around! The CX is Carver’s reverse-kingpin surfskate front truck. It has more pump and tighter turning than any other reverse kingpin truck on the market, but without any extra parts. A similar feel to the C7, allowing you to snap your turns from the tail and pump effortlessly for speed. It is more responsive than a C7 truck, with a lot more play in the tail, similar to a quad fin! This set-up comes with the Powell Peralta Cabarello Chinese Dragon deck and RAD 72mm wheels for extra performance! C7 is Carver’s signature surfskate front truck. It has an incredible amount of pump and a tight turning radius. They also feature a spring loaded swing arm that allows the nose of the board to sway slightly from side to side. This creates slightly wider and more stable turns than a CX truck. Basically, it feels more like a twin fin to ride, but has an adjustable spring you can tension or loosen to vary your ride. CX is Carver’s reverse-kingpin surfskate front truck. This truck has more pump and tighter turning than any other reverse kingpin truck on the market, without the extra parts. It has a similar feel to the C7, allowing you to snap your turns from the tail and pump effortlessly for speed. They feel more responsive than a C7 truck, with a lot more play in the tail, similar to a quad fin! There are definitely not many of these custom Powell Peralta Cabarello Street 29.75″ Carver Completes floating around! After customising numerous Powell Peralta boards with Carver C7 and CX 6.5″ trucks, we thought it was time to offer this online! After customising numerous Powell Peralta boards with Carver C7 and CX 6.5″ trucks, we thought it was time to offer this online! This set-up comes with the Powell Peralta Mike McGill Skull & Snake deck and RAD 72mm wheels for extra performance! This set-up comes with the red Powell Peralta OG Ripper 31.75″ deck and RAD 72mm wheels for that extra slide. There are definitely not many of these floating around! This set-up comes with the yellow Powell Peralta Powell Peralto Rodriguez Skull & Sword Snub Nose OG deck and RAD Release 72mm wheels for extra performance! After customizing numerous Powell Peralta boards with Carver CX 6.5″ trucks, we thought it was time to offer this online! This set-up comes with the new Pink Powell Peralta Steadman Spade deck and Rad release wheels for that extra slide – there are definitely not many of these floating around! The Riptide Carver C7 Riptide 96A Pivot Cups, come in a set of two. These are designed specifically for Carver C7 and C2 trucks to reduce slop in your truck. Overall this provides riders with a more lively and responsive feel. These pivot cups are designed with Riptide’s WFB formula and offers riders nothing but the best for their trucks. Don’t let your trucks die on you, just get a set of these pivot cups to liven them up! The Riptide Carver CX Riptide 96A Pivot Cups, come in a set of two. These are designed specifically for Carver CX and C2 trucks to reduce slop in your truck. Overall this provides riders with a more lively and responsive feel.